This article requires a subscription to view the full text. If you have a subscription you may use the login form below to view the article. Access to this article can also be purchased. Purpose: The purpose of this study was to compare sharpening efficiency and metal (carbon steel) removal from scalers using two types of synthetic sharpening stones: ceramic and diamond-plated. Previous research used scanning electron microscopy alone to measure instrument sharpness. Additionally, no research has been reported on the use of diamond-plated sharpening stones. Methods: Fifteen threaded, double-ended H6/H7 scalers were randomly divided into three groups of ten: control, ceramic stone, and diamond-plated stone. All cutting edges were dulled by scaling the surfaces of extracted molars. The cutting edges were then sharpened by a blinded examiner with the assigned stone until optimal sharpness was achieved using a test stick between sharpening strokes. The number of strokes needed to reach sharpness for each cutting edge was recorded. Four hundred sharpening strokes were then applied on each end using the assigned stone. The scaler ends were weighed before and after sharpening to determine amount of material loss in milligrams. Statistical analysis was performed using ANOVA followed by a Tukey-Kramer post-hoc test. Results: The diamond-plated sharpening stone removed significantly more metal (7.62 mg +/-0.38) than the ceramic stone (0.69 mg +/-0.06) (p<0.001), while there was no significant difference between the ceramic sharpening stone and the control. There was no significant difference between diamond-plated and ceramic stones in the number of strokes needed to sharpen scalers. Conclusion: While a similar number of strokes was needed to sharpen scalers with the diamond-plated or ceramic stone, the diamond-plated stone removed nearly 7 mg more metal than the ceramic stone using a standardized number of sharpening strokes, suggesting greater scaler longevity when using a ceramic sharpening stone. The use of a sharp scaler is crucial for adequate calculus removal during periodontal instrumentation. Dull scalers can result in fatigue, less control, need for excessive lateral pressure, and failure to remove deposits entirely. After repeated use, a scaler's cutting edges begin to dull. This requires sharpening of the instrument in order to regain its optimal cutting edge. Sharpening entails the removal of small increments of metal from the cutting edge. The final goal of sharpening is to restore the instrument's cutting edge to its original shape while removing as little metal as possible.1 No research has been reported in the literature to date, comparing the amount of metal removal during instrument sharpening with various sharpening stones. Sharpening stone selection is crucial to obtaining an optimally sharp cutting edge while retaining the instrument's original shape. There are two categories of stones: natural abrasive stones and synthetic stones. Natural abrasive stones are derived from natural sources such as the Arkansas stone and India stone. Synthetic stones are artificially constructed stones, which include ceramic, carborundum, ruby, and diamond stones. Sharpening stones range in abrasive levels from extra fine to coarse grit. The coarser the stone, the quicker the metal is removed from the instrument. When using a coarse stone, it is important to follow up with a fine grit stone in order to produce a smooth, uniform surface along the cutting edge.2 In 2015, a new diamond-plated synthetic sharpening stone came onto the market in medium, fine, and extra fine grit. Research needs to be conducted to determine if this new sharpening stone is superior or equivalent to other synthetic stone options. Diamond-plated stones are new to the market and research is currently lacking on this synthetic stone. More specifically, there is a lack of research on how the diamond-plated stone compares to a ceramic stone in its ability to provide a sharp cutting edge while removing the least amount of metal from a scaler. 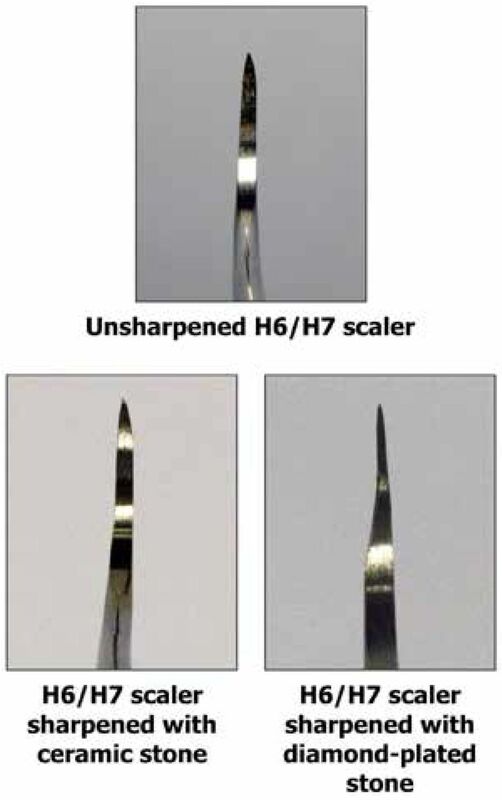 The purpose of this study was to compare the sharpening efficiency and the amount of metal (carbon steel) removal from scalers using two types of synthetic sharpening stones: ceramic and diamond-plated. Fifteen, double-ended carbon steel scalers (H6/H7; G. Hartzell and Son, Concord, CA) with threaded tips were used for this study. Activation strokes were performed in increments of 50, on five scalers on extracted molars to determine the number of strokes required to achieve appropriate dullness. Dullness was determined by an experienced dental hygienist (principal investigator, HH). A minimum of 300 activation strokes were performed on each of the 60 cutting edges until dullness was achieved. An experienced dental hygienist (HH) used an acrylic test stick to assess the level of dullness for each cutting edge. The thirty scaler ends were labeled, submitted into an electronic randomizer, and divided into three groups of ten: control, fine ceramic stone, and fine diamond-plated stone. The control group did not receive any sharpening treatment but was weighed at the same intervals as the experimental groups in order to evaluate variation in the measurement technique. Each cutting edge in the two treatment groups was sharpened with the assigned stone using a sharpening guide (PDT-Gleason Guide™; Paradise Dental Technology, Missoula, MT) to standardize the stone angulation. For the initial sharpening of the scaler, a dental hygiene student researcher (LS) used five strokes for each cutting edge. A blinded, experienced dental hygienist (HH) tested each cutting edge for sharpness with an acrylic test stick. Additional strokes were assigned and performed until sharpness was attained as determined by the same experienced dental hygienist (HH). Sharpening efficiency for each end of the instrument was calculated by adding together the number of strokes to sharpen each of the two cutting edges. In order to assess metal removal comparing the three groups, a second dental hygiene student researcher (ES) detached each end and determined initial weight with an analytical laboratory digital balance scale (Mettler Toledo AG285; Columbus, OH), sensitivity of 0.1 mg. A pilot study was performed using two scalers to determine how many sharpening strokes were required to remove at least one mg (threshold to represent ten times the sensitivity of the balance) of carbon steel. Researcher (LS) performed sharpening in increments of 50 strokes and continued until 1 mg of metal was lost using the ceramic stone, resulting in 650 strokes per instrument end. The same researcher (LS) attempted 650 strokes using the diamond-plated stone; prior to reaching this threshold, a significant amount of metal was lost. Thus, the researchers chose 400 strokes as the threshold for evaluating both ceramic and diamond-plated stones. Researcher (LS) sharpened each end with its assigned stone using 400 strokes. A final weight was determined for each end by researcher (ES). A one-way analysis of variance (ANOVA) was used to determine whether the control, ceramic sharpening stone, and diamond-plated sharpening stone differed with respect to the number of strokes needed to sharpen the scalers and the amount of metal removed as a result of instrument sharpening. A Tukey-Kramer Post-hoc Test was performed to evaluate all pairwise comparisons among the three groups. Statistical significance was set at p< 0.05. There was no statistically significant difference between the diamond-plated and ceramic stones with respect to the number of strokes needed to sharpen the scalers (Table I); however, there was a statistically significant difference between the diamond-plated and ceramic stones versus the control group (p < 0.001). After 400 sharpening strokes, the diamond-plated stone removed significantly more metal from the scalers than the ceramic stone (p <0.001; Table II; Figure 1). There was no statistically significant difference in weight change of the scalers between the ceramic stone and control groups. It was hypothesized that the diamond-plated stone would produce a sharp cutting edge using fewer sharpening strokes when compared to the ceramic stone; however, this study showed both stones produced a sharp cutting edge using a similar number of strokes. This study also evaluated the amount of metal lost following 400 strokes per instrument end for each stone. It was hypothesized that the diamond-plated stone would remove more of the instrument material. The control group did not receive any strokes, but was weighed before and after to evaluate variation in the measurement technique. The minimal weight change in the control group demonstrated that the weighing technique was reliable. When comparing the three groups, it was found that there was no statistically significant difference in weight change between the ceramic stone and the control, suggesting that the ceramic stone does not remove a significant amount of material during sharpening. However, the diamond-plated stone removed nearly 7 mg more metal than the ceramic stone. This finding confirms the hypothesis that when using a diamond-plated stone, more material is lost after multiple sharpening sessions compared to the ceramic stone. While irregularities and the presence of a dull, beveled cutting edge can be examined under SEM magnification, the use of a hard, acrylic test stick is the optimal method for evaluating cutting edge sharpness in a traditional clinical setting. The majority of the historical sharpening research has been conducted with SEM technology, yet the acrylic test stick has been shown to have comparable results according to a 1989 study by Hoffman, et al. Testing for sharpness is not a quantifiable measure and this study approached evaluation from the approach of applications to clinical practice and relevance. While this is a limitation due to operator variability and subjectivity in measuring sharpness, operator variance would exist with SEM as a means of measurement as well. Future research should utilize both methods for further comparison. Another limitation of the study was the inability to ensure all instruments were equally dulled at the start of the study. Strokes were taken in increments of 50 and performed without the use of a calibrated machine to maintain consistency in angulation, adaptation, and pressure. However, the same experienced clinician (HH) determined the initial dullness for each cutting edge used. Intra-rater reliability was also established by practicing the study protocol prior to actual data collection. It is in the clinician's best interest to select a stone that provides both time efficiency and preservation of material. The ceramic stone is shown to offer both of these advantages, suggesting that the ceramic stone may be a better choice compared to the diamond-plated stone. Scaling instruments have reduced longevity when more metal is removed. Using the calculated means, it is estimated that a clinician would be able to utilize a scaler sharpened with a ceramic stone approximately ten times longer than one sharpened with a diamond-plated stone. This study established a protocol for determining metal loss during sharpening. Previous studies have not utilized weight loss as a means of determining removal of material. This protocol can now be used in future studies to examine different types of scalers and curettes of various materials as well as different types of sharpening stones. Based on the results of this study, the ceramic stone is preferable to the diamond-plated stone because significantly less metal is removed and sharpening efficiency is comparable. This study suggests that the use of a ceramic stone as compared to the diamond-plated stone, would result in greater scaler longevity because significantly less metal is removed in the sharpening process. The authors would like to thank Bobby Simetich, for his laboratory assistance, as well as the UNMC College of Dentistry F. Gene and Rosemary Dixon Endowed Chair in Dentistry (Dr. Jeffrey B. Payne, recipient) and the UNMC Summer Student Research Fellowship Grant #FY16-25 for funding this research. Heather M. Hessheimer, RDH, MS, is an assistant professor; Jeffrey B. Payne, DDS, M Dent Sc, is a professor and the F. Gene and Rosemary Dixon Endowed Chair in Dentistry, Department of Surgical Specialties; Laura E. Shaw, RDH, BS and Erica M. Spanyers, RDH, BS are graduates of the Department of Dental Hygiene; all at the University of Nebraska Medical Center (UNMC) College of Dentistry, Lincoln, NE. Mark W. Beatty, DDS, MSE, MSD, MS, is affiliated with the Veterans' Administration, Nebraska-Western Iowa Healthcare System and and is a professor, University of Nebraska Medical Center, College of Dentistry, Department of Adult Restorative Dentistry. This manuscript supports the NDHRA priority area Professional development: Occupational health (methods to reduce occupational stressors).
. Instrument care and sharpening. In: Wilkins EM, Wyche CJ, Boyd LD, ed.Clinical practice of the dental hygienist. 12th ed. Philadelphia, PA. Wolters Kluwer. 2017. p. 685-697.
. Instrument sharpening. In: Periodontal instrumentation. 2nd ed. East Norwalk, CT. Appleton & Lange. 1992. p. 288-300.
. Scanning electron microscope assessment of several resharpening techniques on the cutting edges of gracey curettes. J Contemp Dent Pract. 2007 Nov;8(7):1-13.
. Scanning electron microscopic evaluation of several resharpening techniques. J Periodontol. 1982 Oct;54(10):618-623.
. Evaluation of three different manual techniques of sharpening curettes through a scanning electron microscope: a randomized controlled experimental study. Int J Dent Hyg. 2015 May;13(2):145-150.
. Effect of different sharpening stones on periodontal curettes evaluated by scanning electron microscopy. J Formos Med Assoc. 1991 Aug;90(8):782-787.
. Scanning electron microscope evaluation of two methods of resharpening periodontal curets: a comparative study. J Periodontol. 2003 July;74(7):1032-1037.
. Effect of repeated sterilization cycles on the physical properties of scaling instruments: a scanning electron microscopy study. J Int Oral Health. 2015 May;7(5):1-4.
. A scanning electron microscope study comparing the effectiveness of different types of sharpening stones and curets. J Periodontol. 1995 Nov;66(11):956-961.
. Sharpening of periodontal instruments with different sharpening stones and its influence upon root debridement-scanning electron microscopy assessment. J Int Acad Periodontol. 2006 Jan;8(1):17-22.
. Assessment of curette sharpness. J Dent Hyg. 1989 Oct;63(8):382-387. Thank you for your interest in spreading the word on Journal of Dental Hygiene. Message Body (Your Name) thought you would like to see the Journal of Dental Hygiene web site.